You know when Target puts Easter candy out on February 15th? I can’t even get mad at that because I am totally crazy about Cadbury Eggs. I don’t discriminate either. Whether it be Cadbury Chocolate Mini Eggs or Crème Eggs, I have to have them. I try to only buy the “single serving” bag of the Mini Eggs out of fear for eating an ENTIRE bag. I know I have been a little obsessed with brookies lately and truth be told, I have more that I haven’t even shown you. 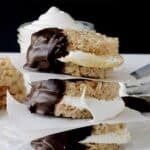 Once I find a new dessert, I sort of obsess over it for while, make a few versions of it and then move on. 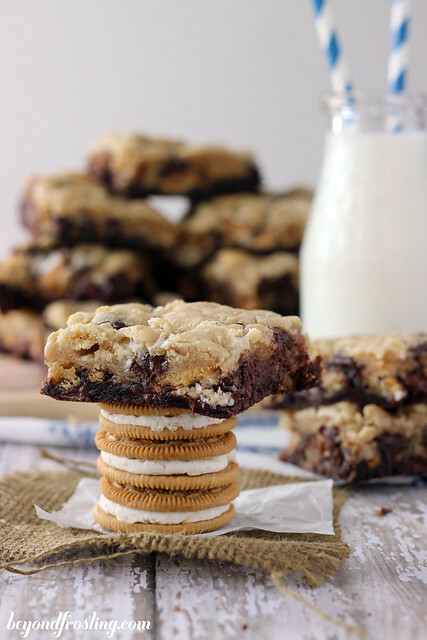 Have you seen my Thin Mint Brookies or my Marshmallow Oreo Brookies? The brookie I have today is…wait for it…. Cadbury Stuffed Brookies. 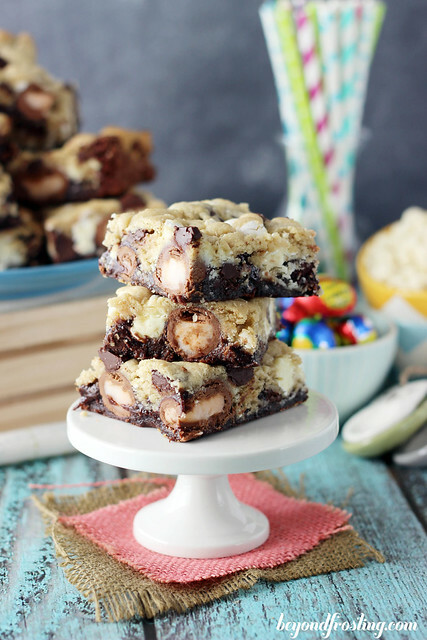 First, the layer of brownies on the bottom is packed with mini Cadbury Crème Eggs. Second, the chocolate chip cookie has a whole bag of smashed Cadbury Chocolate Mini Eggs. I can’t decide which layer I like better. For the brownie layer, I chose to use the MINI version of the Cadbury Crème Eggs, you know the ones that are the size of a Peanut M&M? 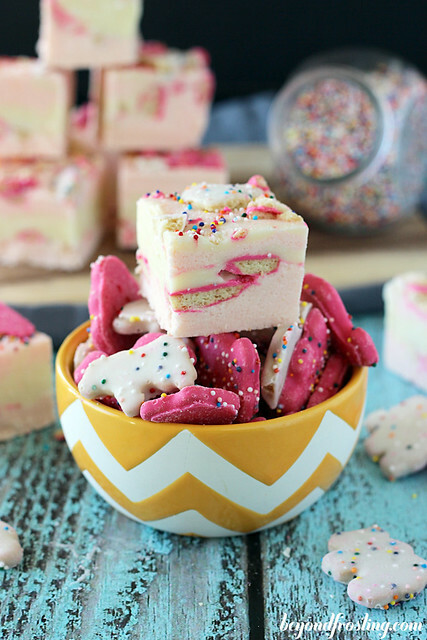 That way, I can easily pack the cookie dough layer over the top. When baked, the eggs melt slightly but still hold their shape. I love it! For the cookie dough layer, I smashed a bag of Chocolate Mini Eggs and mixed them right into the cookie dough batter. The ones I used were the white chocolate version, but I think I prefer the milk chocolate version myself. The food processor didn’t work for me, so I actually used a rolling pin to smash them. 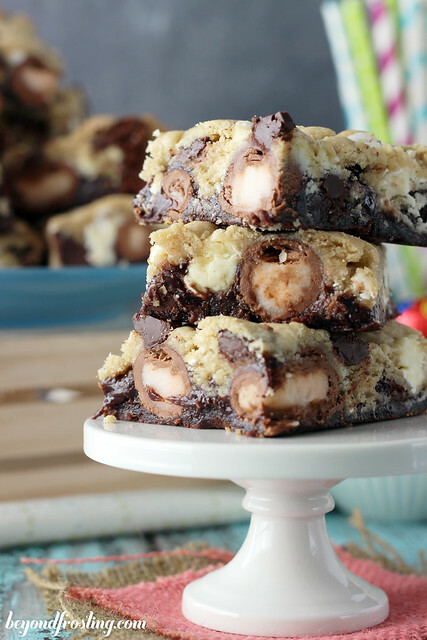 A layer of brownies packed with Cadbury Creme Eggs. 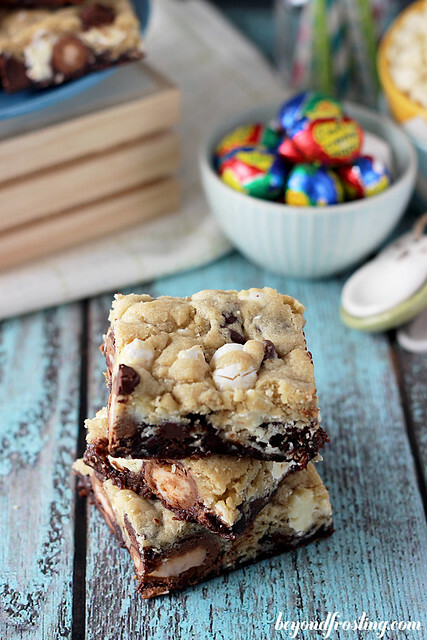 Topped with a chocolate chip cookie layer mixed with Cadbury Chocolate Mini Eggs. Empty a full bag of Cadbury Chocolate Mini Eggs into a Ziploc bag. Crush eggs into smaller pieces using a rolling pin. Set aside. 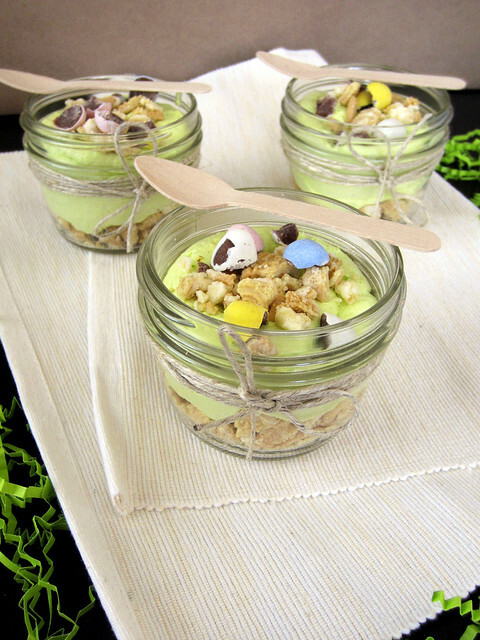 Unwrap all the Cadbury Mini Creme Eggs and set aside. In a medium-sized bowl, combine brownie mix, egg, vegetable oil and milk. Beat until thoroughly mixed. Line a 9″x13” pan with parchment paper or a baking mat. Pour brownie mixture over the baking mat and spread evenly. Line up the Cadbury Mini Creme Eggs in a row up and down pan. Press gently into brownie mix. In a separate bowl, combine flour, salt and baking soda. Slowly add flour mixture to batter while mixing at a low speed. Once all the flour has been added, increase speed to medium until dough forms. 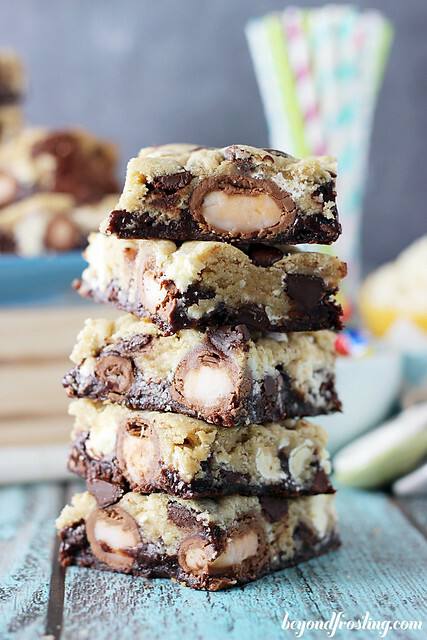 Add chocolate chips and crushed Cadbury Chocolate Mini Eggs last and fold into cookie dough until thoroughly mixed. Take cookie dough and drop chunks onto the top of the brownie mixture, gently pressing them down into brownie batter. I know I’m super late to the party, but how big is the bag of mini eggs? I can only find a 16oz bag and that seems enormous. So maybe 8oz of mini eggs would be close to the smaller bag? Thanks!